I saw Equals shortly after my best friend's family—and by extension my family—had suffered a horrible loss. So I think I was more affected by its message than I would've been otherwise. Director Drake Doremus (Like Crazy) retreads very, very familiar territory (think The Giver mixed with Romeo & Juliet) and doesn't have anything new to add to the conversation, and on top of that, the film's cop-out ending made me groan. 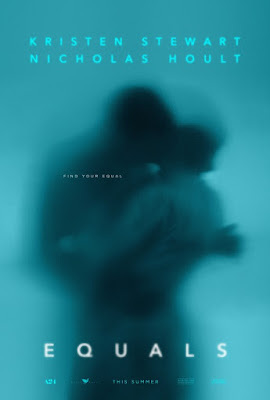 But since Equals' story centers around the question of whether it's better to experience the highs and lows (but especially the lows) that come with being human versus feeling nothing at all, and since I would've done anything to stop my friend from feeling the pain she was going through at that time, I was captivated for 101 minutes, if nothing else. 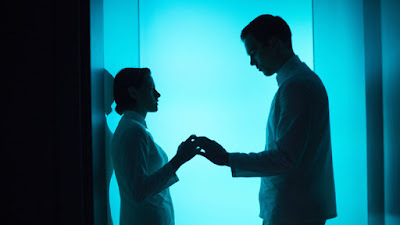 Silas (Nicholas Hoult) and Nia (Kristen Stewart) are part of "The Collective," our future society where human DNA has been manipulated in order to prevent emotions. Most of the population has been wiped out thanks to a world war, although there's talk of a group of people who live outside of The Collective and still have feelings. Silas, Nia and their robot-like counterparts at work are able to have discussions and whatnot, but their lives are pretty darn boring. Then one day Nicholas realizes that he's starting to have dreams and feel slivers of emotions—and he has reason to suspect Nia is as well. Oh no! This means they are both "infected" with Switched On Sydrome (SOS—GET IT?!?) and are going to be thrown in "the den" to be experimented on and will never be seen again. It's obvious that despite the imminent danger they'd be in if they start acting on their emotions, Silas and Nia will soon fall for each other anyway and then have to work increasingly hard to keep their forbidden relationship a secret. This whole "star-crossed lovers" thing inspired cinematographer John Guleserian to give us lots and lots and LOTS of longing looks and glances and dreamy closeups of faces and lips and hands touching. (These are things Stewart is really good at from her Twilight experience, though, and I'm not even joking.) However, no matter how earnest the leads are in their roles, the extreme multitude of the aforementioned shots—combined with the sometimes-overbearing emo score from Sascha Ring and Dustin O'Halloran—make the film come off as more than a little ridiculous. The only breath of fresh air arrives in the form of a few scenes with other "infecteds," played by Guy Pearce and Jacki Weaver, among others. The pace picks up a bit when they hatch a plan to help Silas and Nia escape The Collective. But it's not enough to save the film overall. We all already know that as much as it hurts to experience loss, sadness and pain, having the full spectrum of human emotions is still worth it. It's a shame Doremus couldn't find anything else to say besides the obvious in Equals.